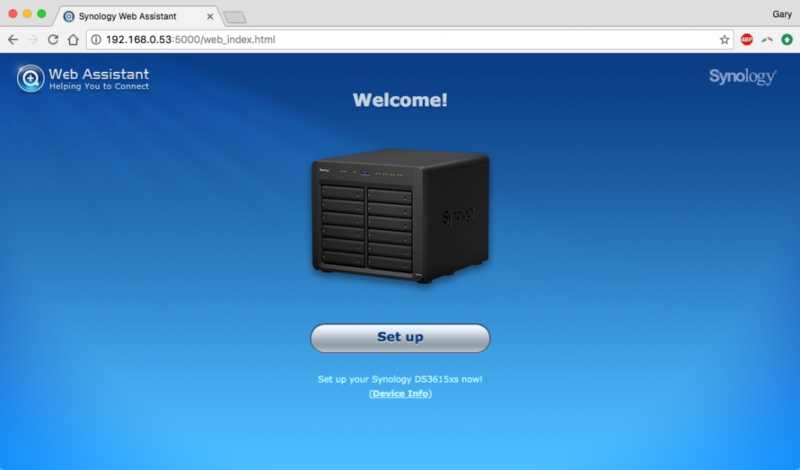 Since Installing Server 2016 on my Mac Mini, I’ve been looking for some dedicated storage for my home lab so I’ve put together a DIY Synology NAS running XPEnology. 1 What is a NAS? NAS stands for Network Attached Storage, and is in essence device full of hard drives providing data access across a network. In some regards its very similar to a traditional file server, but without the software overhead of running an operating system likes Windows Server. 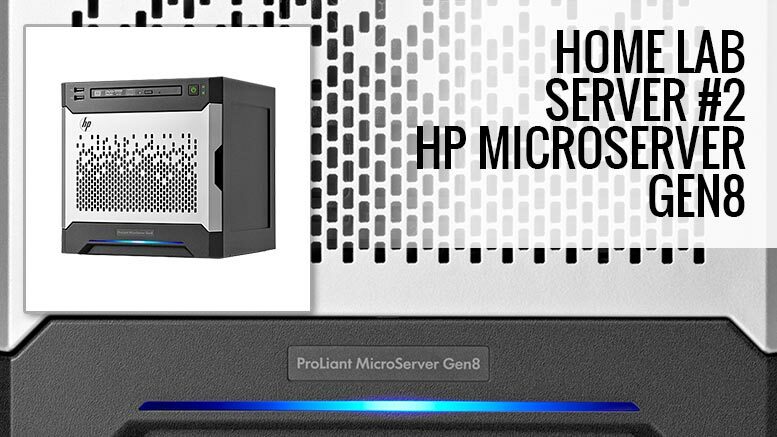 I’ve been using my Gen8 Microserver for the last year and a half as a general file server running Windows Server 2012 R2 and its been working brilliantly. It’s been quite happily serving up PLEX, multiple file shares, a bit of BitTorrent and numerous other miscellaneous things without fault. The one thing I don’t much care for is Windows Server’s iSCSI setups and as i’m migrating my Mac Mini back over to run VMWare ESXi shortly, I need something dedicated that’s going to be easy to setup and manage. The added bonus is that I wont need to rely on the internal SSD of the Mac Mini – potentially freeing it up for other applications. 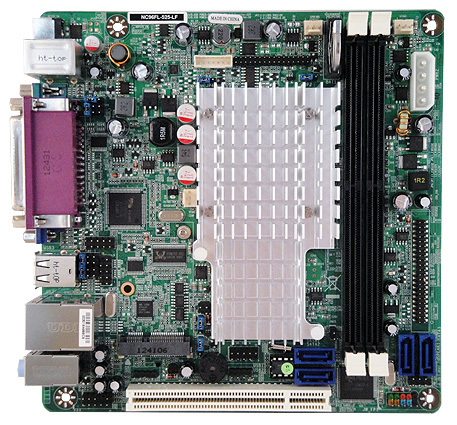 I’ve been trawling on Ebay recently for something that I can use as a basis for my NAS box, initially I just thought that i’d pick up another Gen8 Microserver but I wanted to see if I could do it a little cheaper this time (and more DIY). The board also came with 2GB of DDR3 and a power brick and set me back a princely £22 + postage. All I needed was a case to put it in so after more ebaying (and £10 later) I had a generic “appliance” style case. Because of the on-board nature of the PSU i decided to use a couple of 500GB laptop HDD’s that I’ve had kicking around for a while – this will be enough to get me started but in the long run i’ll migrate to much faster SSD’s as budgets allow. 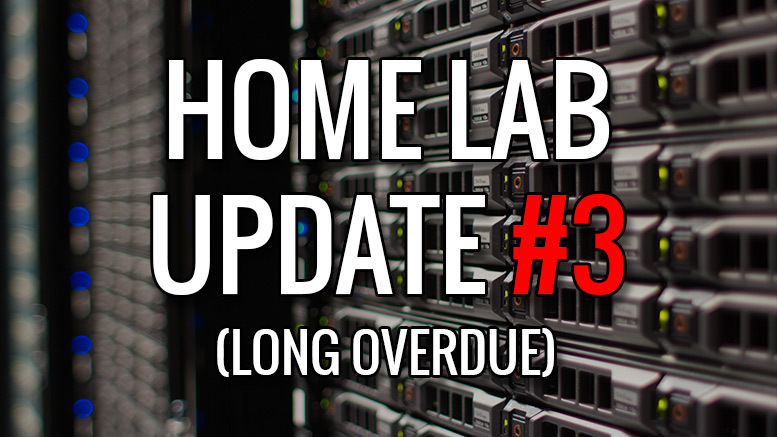 I’ve been playing around with a few NAS operating systems over the last few weeks while I’ve been waiting for all my parts to arrive, and testing them out in my current HyperV environment. The two i’d originally been playing with were RockStor and FreeNas. RockStor is a very slick little NAS OS that’s very easy to setup – I had a working install about 20 minutes after setup – its very easy to use but it seemed to lack the iSCSI functionality that I was after (its possible that I may have been looking in the wrong place but I couldn’t seem to find anything). FreeNAS is another great OS but it uses the ZFS filesystem that relies on ECC memory for error checking – as my destination hardware wasn’t ECC I discounted this as an option. I’ve always wanted an Synology NAS box but for the features that I’ve wanted, and the multiple disk bays, the price has always been a bit prohibitive. 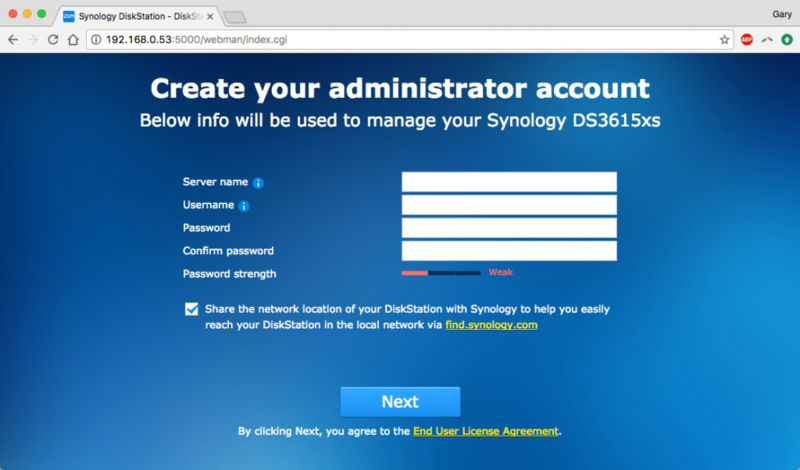 XPEnology allows you to use the Synology DSM operating system on 3rd party hardware creating a DIY Synology NAS. 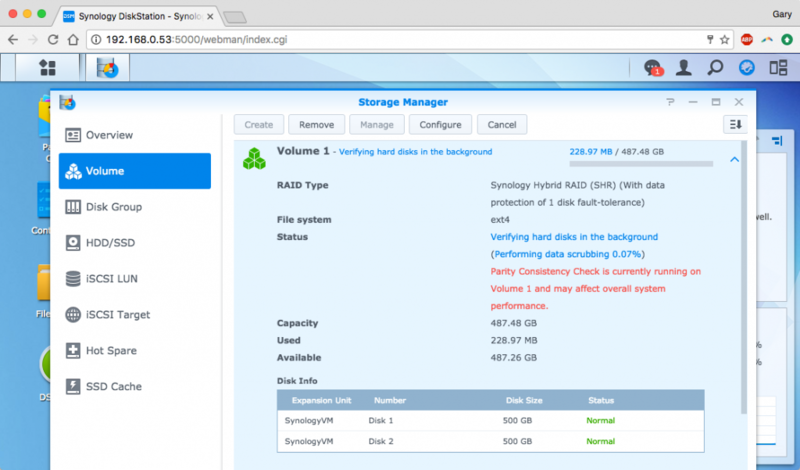 The team behind XPEnology take the opensource Synology DSM OS, write a boot-loader and modify the code slightly so it runs on most x86 and x64 hardware that you can throw at it. 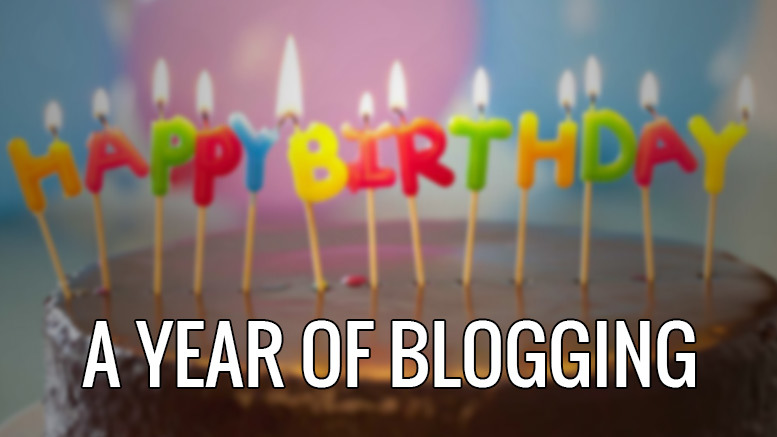 For more info, I suggest you check out the XPEnology website. Note: For easy of screenshotting, i’m documenting the install process using virtual machines – the install process is identical for physical hardware. Install Win32DiskImager.exe, plug in your USB pen drive and create a bootable USB using the downloaded .img file. [Click for general instructions on how to use Win32DiskImager]. Set BIOS of destination hardware to always boot to USB first. Boot the device to USB, and chose the Install/Upgrade option from the menu. Once the hardware has booted you should see the following screen (or very similar). Thats it for the device side, everything is now managed via a web browser on another machine. Next you’ll need to find the IP address of the box. 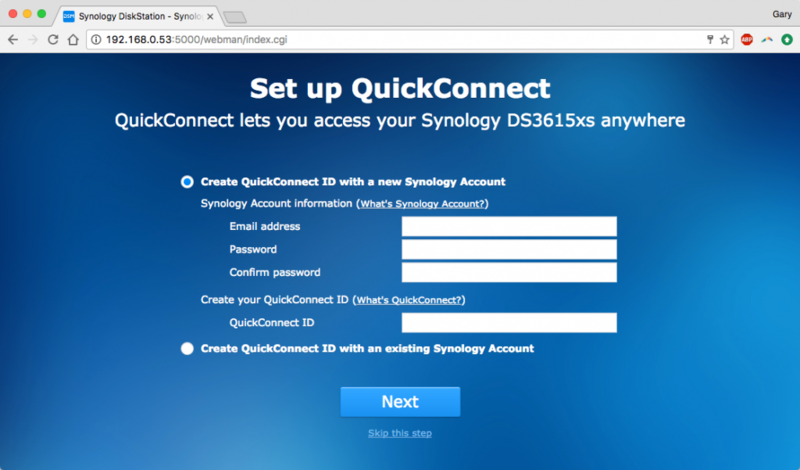 In theory you can simply type http://diskstation.local but I couldn’t connect in this way – I found the IP of the Synology installer using Angry IP Scanner on my Mac. The whole process of setting up the NAS is very straightforward – the Synology software does an excellent jobv of guiding you through the install. Once connected to the NAS via IP or local web address you’ll see the following screen. Click “Set up” to start. If you had a genuine Synology, you’d be able to automatically install the latest software from the internet, as this is a home brew NAS, you need to upload the .pat file you downloaded earlier. 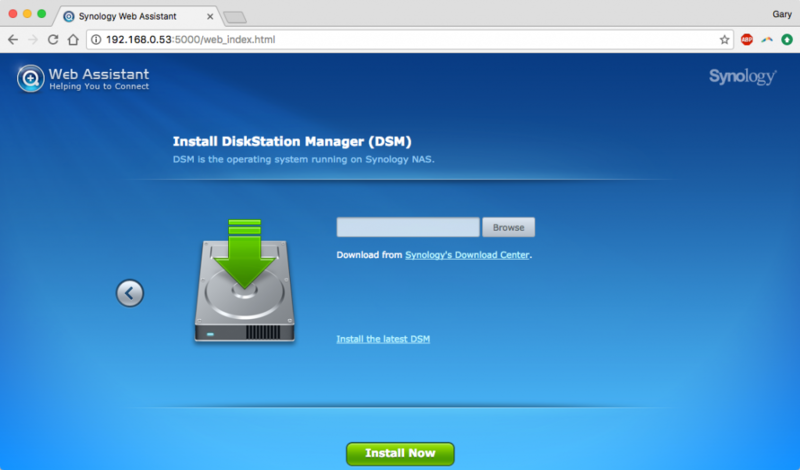 Click the manual install option at the bottom of the page and upload the OS to the NAS. 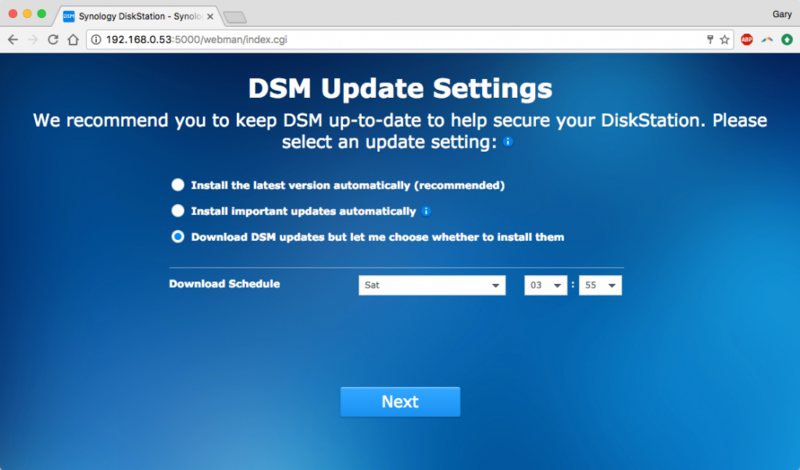 You then informed that the installed disks will be formatted during the installation process – check the box and click ok to proceed to install. The next few screens are the software uploading, installing and then rebooting the NAS. 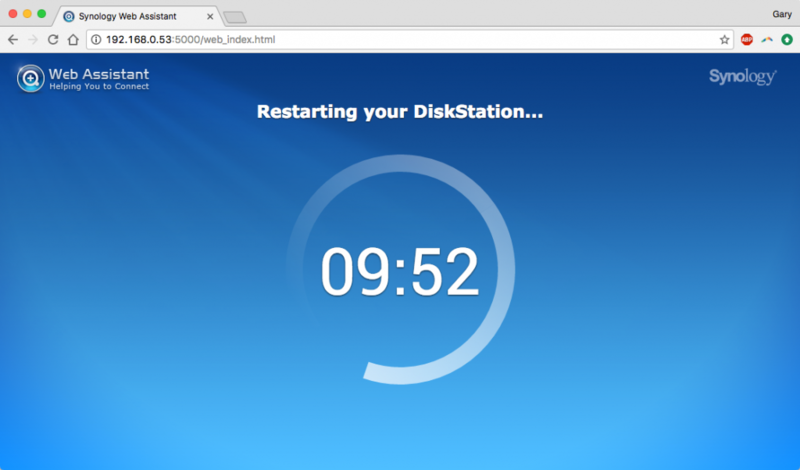 The software allows 10 minutes for the reboot, but you should be able to refresh the browser window after a few minutes. 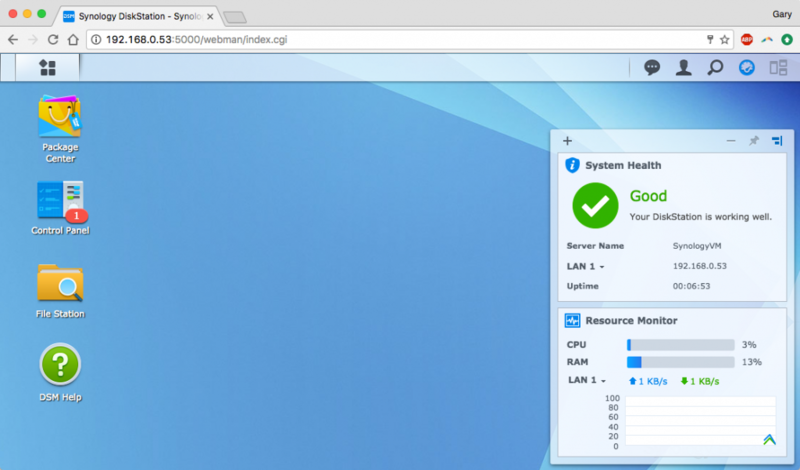 Congratualations, you’ve just installed your own DIY Synology NAS. Now lets get it setup. Log in to the NAS using the username “admin” and no password. You are then promted to give it a name and create an administrator account for the NAS. 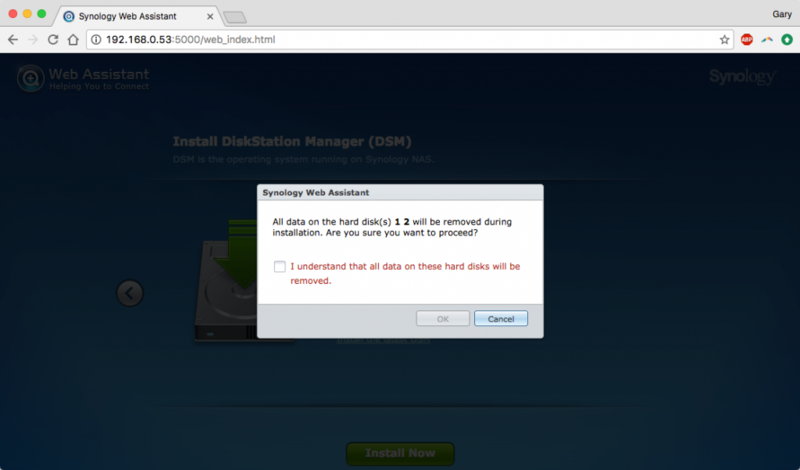 I’d suggest unchecking the “Share the network location..” option so no data is passed back to Synology. Because this is a modified version of the software, you wont be able to auto update to the latest version (you’ll need to manually upgrade in the future). I suggest selecting the download option as there doesn’t seem a way around it. I’ve not tried this but of you are using this in a home lab type environment you probably wont need external access (again, i’m not sure this even works) so I just skipped this section. You are all done. 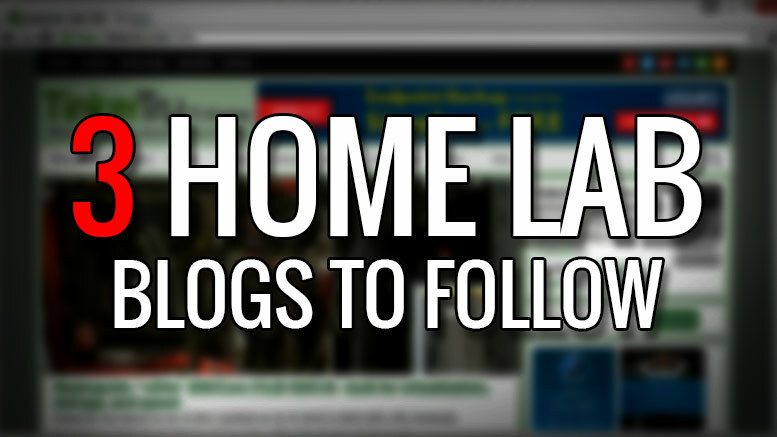 The system should automatically log you on to the NAS. 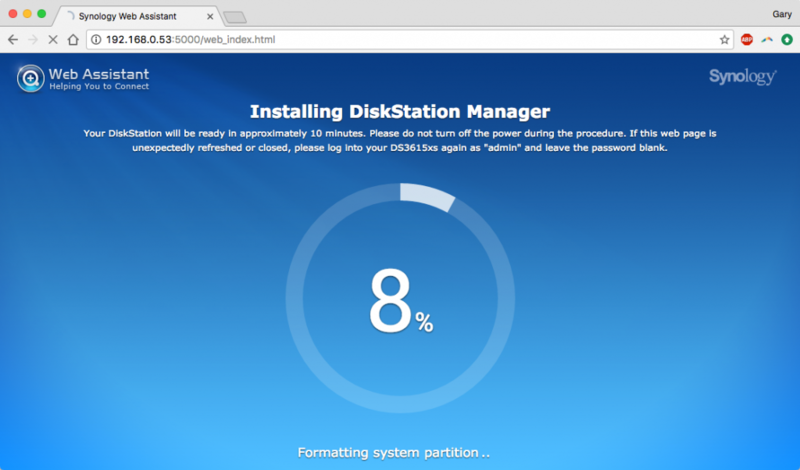 Now you have a functioning DIY Synology NAS, you need to setup the drives to start serving data. 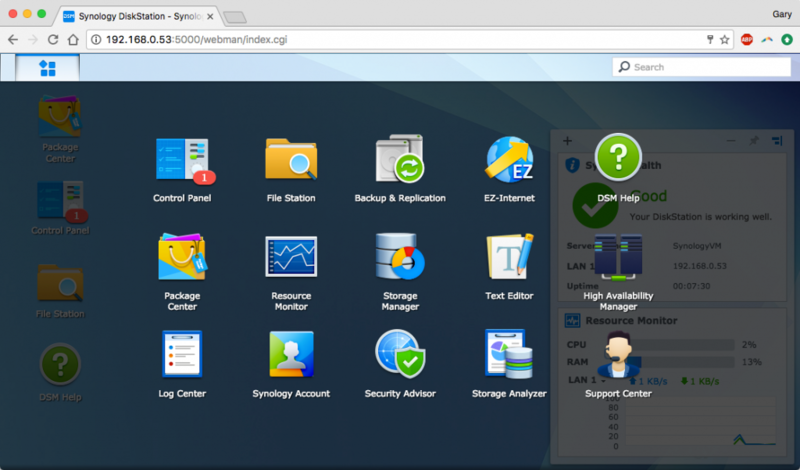 Open up your program panel and click on Storage Manager. Select Volume and the click on the Create button. 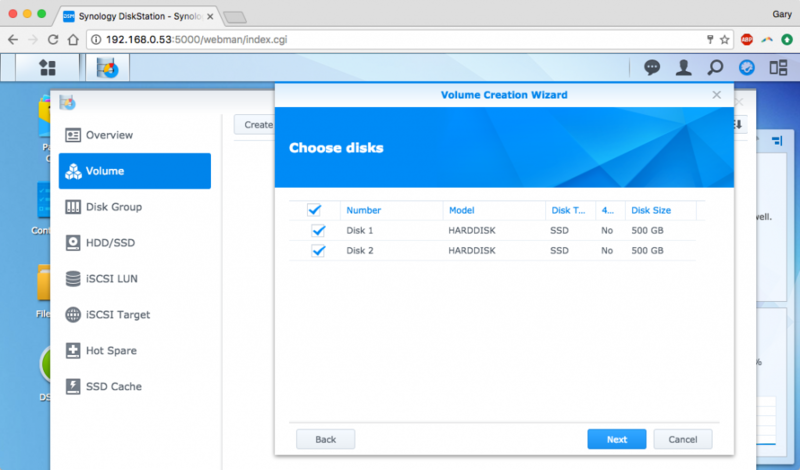 This will launch the volume creation wizard. As I have a two drive setup and am planning to use SHR (Synology Hybrid RAID) I selected quick mode, but if you want some other type of RAID setup and your hardware supports it – you can choose Custom. Choose the disks you want to use for the volume. In my case I want to use both 500GB drives so I selected both. This is an optional stage – if you’d like the software to check for bad sectors and other problems then select Yes, else click No, then next. I’d probably recommend this if you are re-purposing drives from other systems, but if they are brand new then you can probably skip this. The disk checking is very through and will take some time to complete. Now your volume has been created, you need to create some shares so users can access the data across the network. 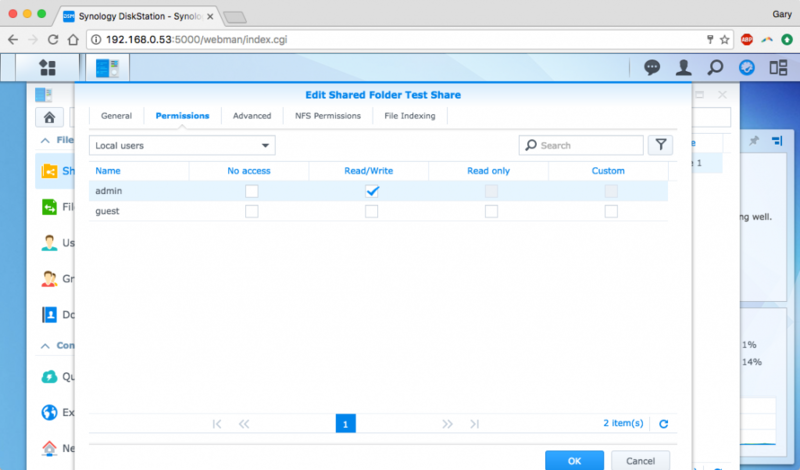 Click on Control Panel, then on Shared Folders and open up the Create New Shared Folder dialogue box. Create a new share and give it a name. Click OK.
You need to give it an appropriate level of access. As we only have a single admin account on the NAS, click on the Read/Write checkbox for the admin account. We are now done and dusted. 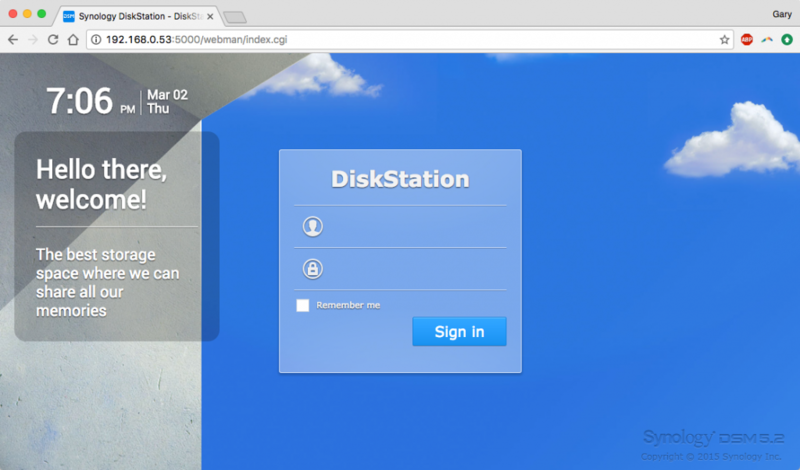 You can now access your new NAS share via your network in the normal way (by mapping a drive, navigating via My Computer on a PC or Finder on a Mac). Start to finish this whole process took me about 30 minutes once the hardware was assembled. The whole install process was rapid – even on this quite low end hardware, also runs great on 2GB RAM as the software has a very low overhead. I’m not overly keen on the case that I picked up, its ok for now but lack the number of drive bays that I want. I really want 2 x 3.5 internal so I can mount 2 x 2.5 inch SSD’s in each or a single external 5.25 inch bay so I can use an Icy Dock 4 Bay 2.5 Sata Mobile Rack. My current case only has a single 3.5 internal bay so i’ll swap this out as soon as budget allows. I also want another Gigabit NIC so I can team the network cards together for improved bandwidth. From my limited testing so far, the single NIC is saturated during file transfers to and from the 2 x 500GB laptop HDD’s. As i’m ultimately planning on using SSD’s in the drive array I’m going to need more throughput. I’ll start to look for a Gigabit PCI NIC online. 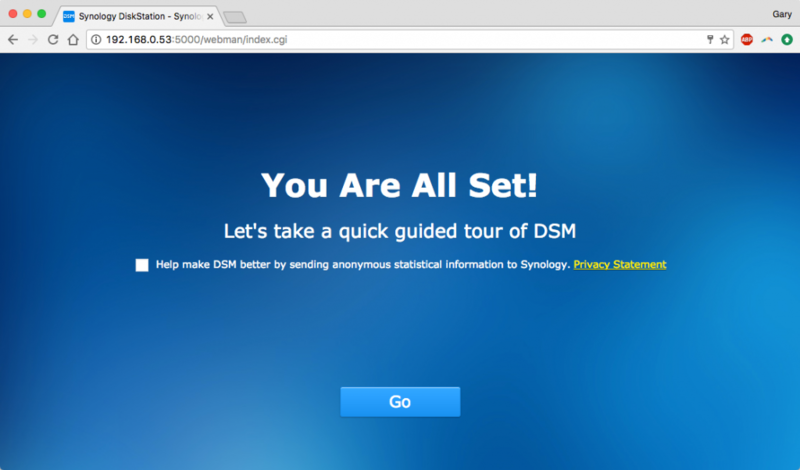 10 Comments on "Building a DIY Synology NAS"
Thanks for writing this guide, do you have issue with updating synology dsm? To be honest i’ve avoided any upgrades so far – there are no features in v6 that have warrented the upgrade. I’d personally be more inclined to avoid an upgrade and just back your data up and do a fresh install of 6, then just copy your data back over. Can you only use the atom processors? I am looking for something more powerful. Does the xpenology limit the cpu you can use? 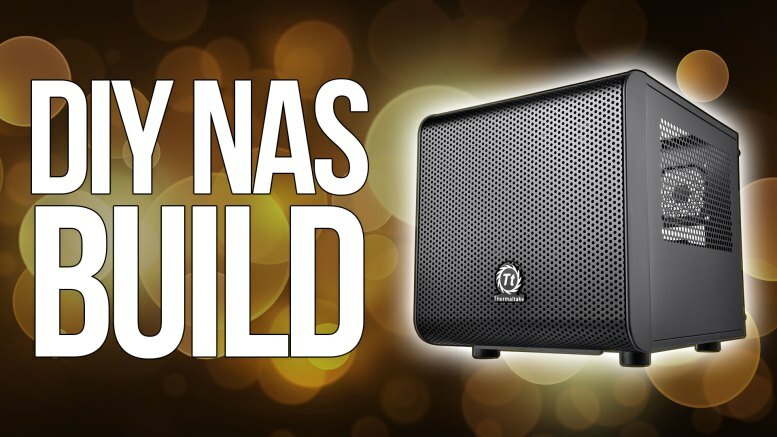 I think you can use pretty much any intel cpu you want – my hardware NAS was based on Atom, but when I rebuilt it as a virtual NAS it was running on an i7 MacMini without any problems. 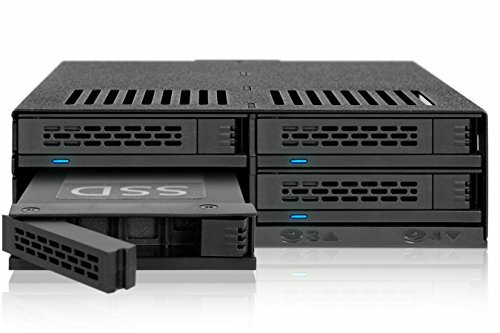 If you look at Synology’s range, the upper tier NAS boxes, like the FlashStation FS3017 or the DiskStation DS3617xs both run on Xeon 6 Core and Xeon D’s respectively. While I can’t comment specifically on your setup, you shouldn’t have too many issues. I’m not sure if you’re following up with this, I tried this little project but the XPEnoboot 5.2-5644.5 DS3615xs would not download because the link was dead. I kept getting a 404 error. 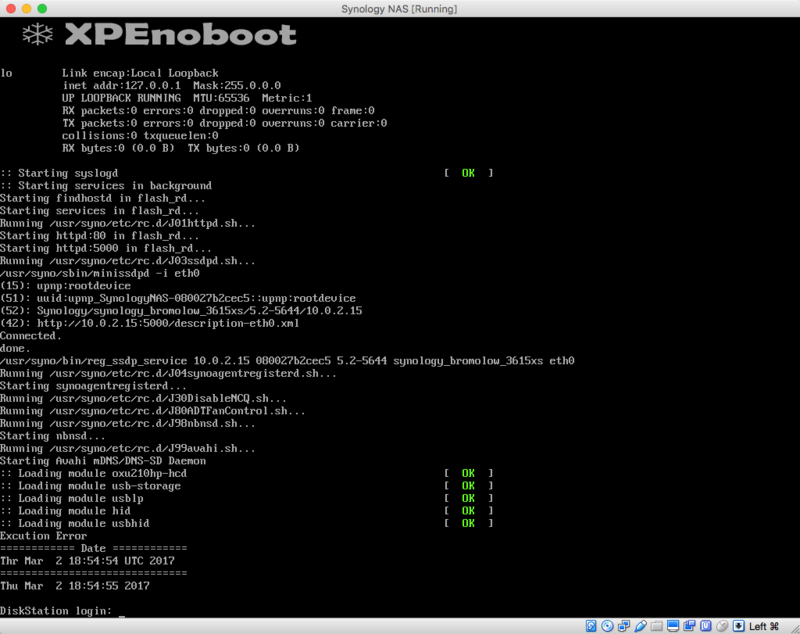 So I downloaded XPEnoboot 5.2-5644.4 DS3615xs. The install seemed to go ok but it didn’t automatically reboot. When I tried logging in via IP, I kept getting an invalid error for the username and/or password. I reformatted the drive and ran the install a second time and the same thing happened. I think it’s because it did not complete by not rebooting. Have you encountered this at all? OK now I feel ridiculous. I skimmed past the admin/no password line. Things seem to OK now. Disregard the previous post. Plex runs like a dream. Very nice write up. 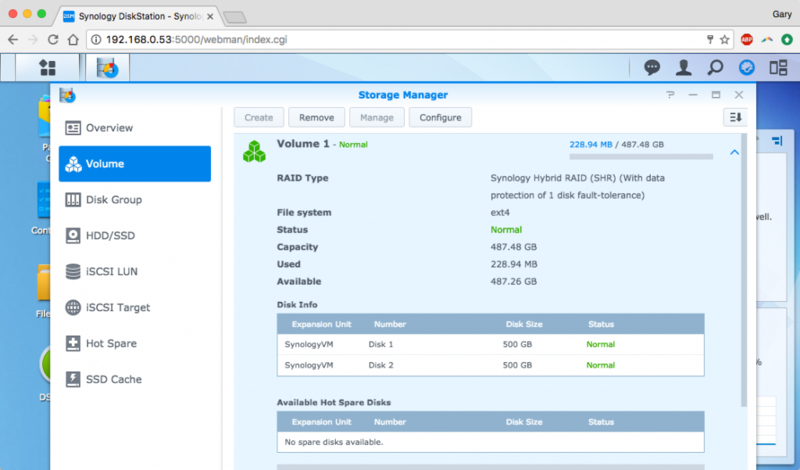 Question regarding SHR, does it require matching size disks as hardware RAID? I suppose it does. I just did an unraid setup for a friend and liked how you could mix disk size. I’ve maxed my DS412+ and really like the interface so want to give this a try. Thx! i cant make de usb boot..
Hi Maffeo, what error message (if any) are you experiencing?